The hustle and bustle of the urban life mean non-stop hectic schedules, but that doesn’t mean you can’t give your skin the lovin’ it needs! 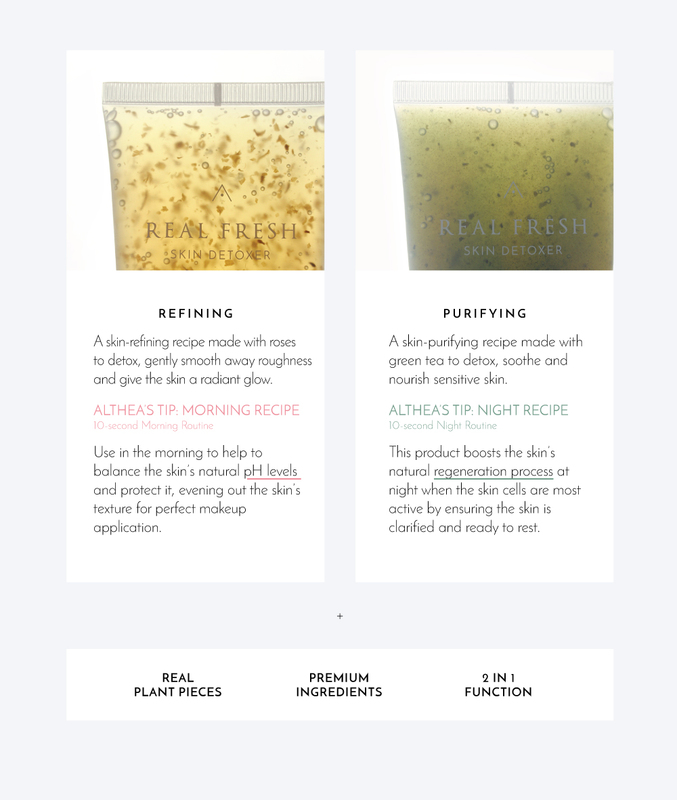 Althea’s Real Fresh Skin Detoxer is a 10-second, 2-in-1 cleanser pack that showcases real, fresh ingredients and incorporates them into a system that allows a deep, clarifying cleanse while boosting the skin with nutrients and goodness. You’ll get both editions in this set: Rose (made with French rose petals + extract to refine the skin) and Green Tea (contains Jeju green tea leaves + extracts to purify). This product leaves the skin feeling fresh and looking smooth for a healthy, happy complexion! Butylene Glycol is actually a human irritant and can be bad for people with extremely sensitive skin, so do take note! Texture: My first thought when I tried this was that it’s a little gooey, and has a gel-like consistency. It’s a bit different from the cleansers I normally use, but it didn’t feel uncomfortably thick or anything. In fact, you won’t really feel like your face is getting clogged or anything, partly due to the fact that you only need to leave this on your face for 10 seconds! I don’t think the effects are super ‘wow’, but they definitely do good stuff for your skin. At SGD 25, I think it’s a little pricey for a cleanser, but I can see why they priced it so when you see how many great ingredients they formulated this with. If you have sensitive skin, I definitely recommend that you try using the Green Tea Detoxer first (though I have to admit that I love the Rose one because it’s so pretty haha).